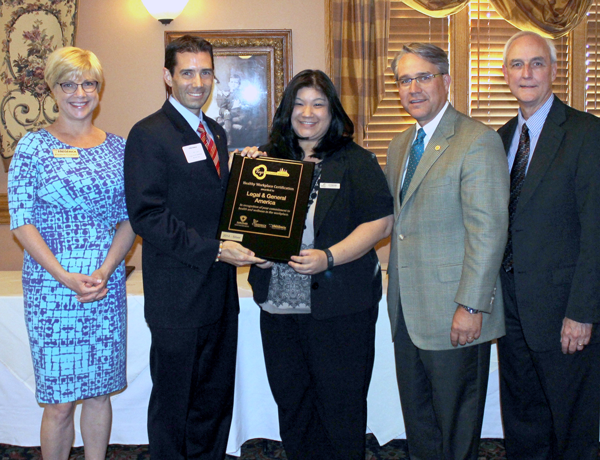 Legal & General America Honored at Frederick County Healthy Workplace Recognition Awards Ceremony. Legal & General America was one of 20 workplaces honored at the annual Healthy Workplace Recognition Awards Ceremony, which recognizes Frederick County workplaces that are committed to improving employee health and well-being. All applicants for the Healthy Workplace Recognition Program completed the CDC Worksite Health Scorecard, which helps employers assess whether they have implemented evidence-based health strategies in their workplace to prevent heart disease, stroke and related conditions such as hypertension, diabetes, and obesity.